Documenting love stories is awesome in itself, but when you get to photograph the love fest of two of your besties is IN-FREAKING-IBLE! I absolutely love Sam, Joey, and their sweetie pie baby girl, Brynn. They are so much fun to be around, can dance up a storm at Dirty Bourbon, and are the kindest, most loving people I have ever met. When they asked me to capture their engagement photos, I knew we had to do something different and special for their sesh. On a cold January morning, Samantha came to my house to get her hair and makeup professionally styled by my sister, Juliette Peralta of Viva Grace Makeup. 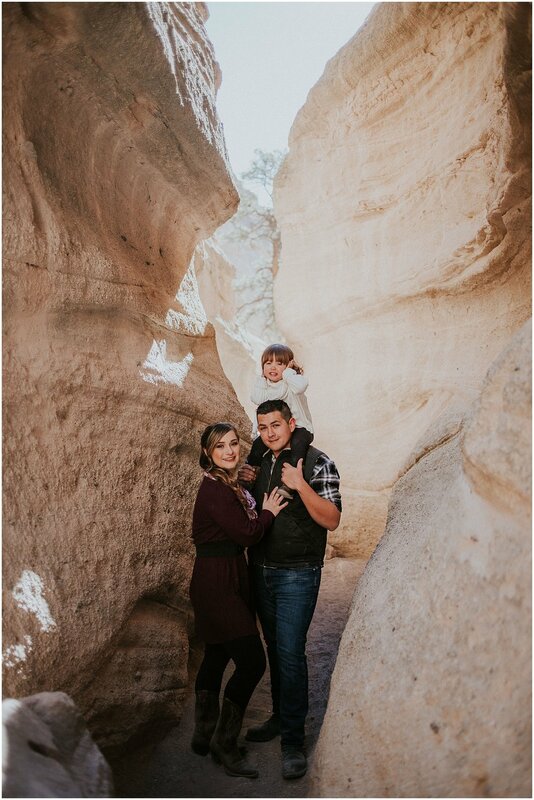 We then all traveled together along with Sam’s awesome grandma to Kasha-Katuwe Tent Rocks National Monument outside of Santa Fe, New Mexico. 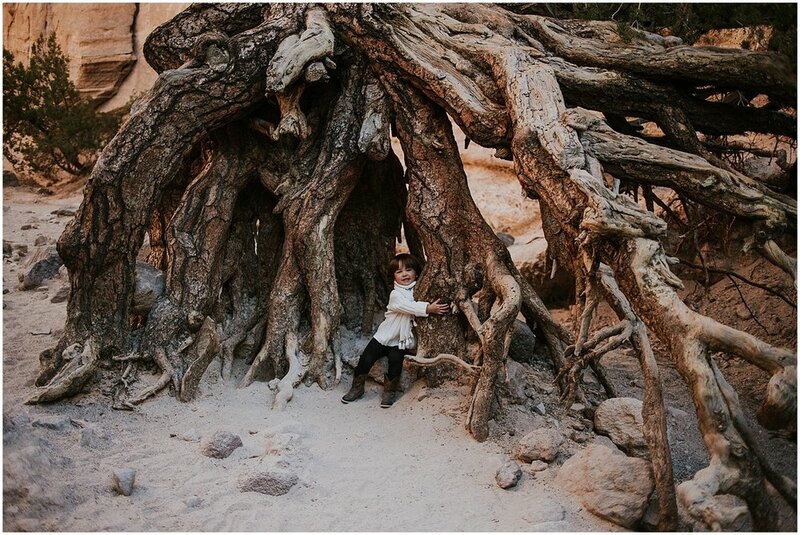 The breathtaking scenery of Tent Rocks was the perfect backdrop to capture their love story with their beautiful daughter. Joey and Sam met for the very first time at her apartment before going to Dirty Bourbon. She had invited a mutual friend to go out to dance with them and he showed up with Joey. They then all planned to go to a dinner together the next week and their mutual friend didn't show up so it was just Joey and Sam at dinner. 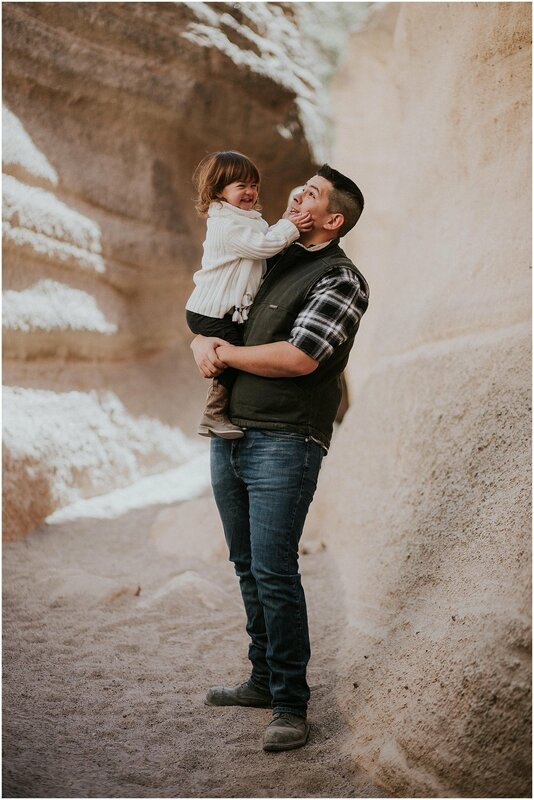 They started talking and getting to know each other, and through multiple more encounters, such as backyard barbecues and hiking through the bosque, they started developing feelings for each other. On July 27, 2018, after they got home from a Tim McGraw concert and may have been slightly tipsy, Joey and Sam decided it was time to give love a shot. Joey and Sam’s love story is not a love at first sight or fairytale story in any way. They worked hard at their relationship and that is what makes it so beautiful. Through extreme hurdles and dark storms, Sam and Joey chose each other time and time again. Relationships aren't about what’s easy, its about what you are willing to fight for, for the rest of your life. 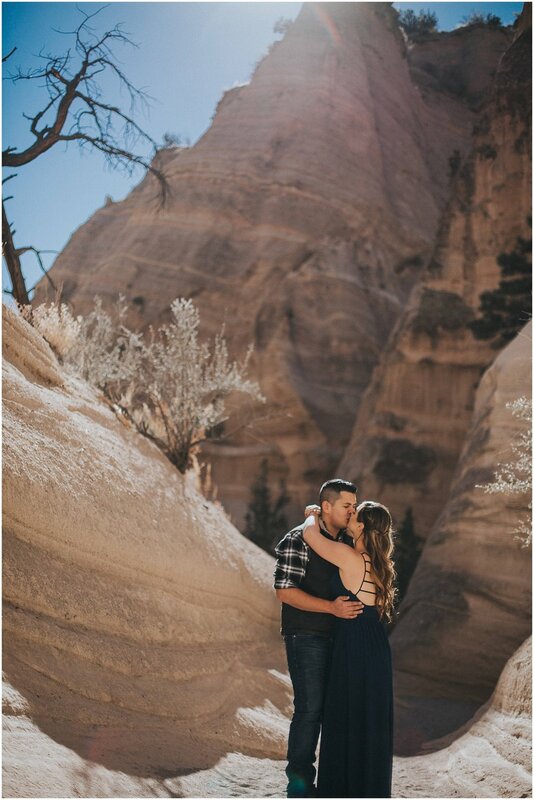 Joey and Sam’s engagement sesh was filled with adventure (the zipper on Sam’s dress broke in the middle of hiking through Tent Rocks. Poor Sam was half naked for a moment while my Joey Macgyver'd it. That guy can fix anything!) and so much beauty. The love they have for not only each other, but for sweet baby Brynn is absolutely extraordinary. Witness love in it’s truest of forms is a magical thing especially when it’s people you love as well! When it came to coordinating outfits for their sesh, Sam knew it was going to be cold outside so they tried to find something that allowed them to move around easily and still feel gorgeous. 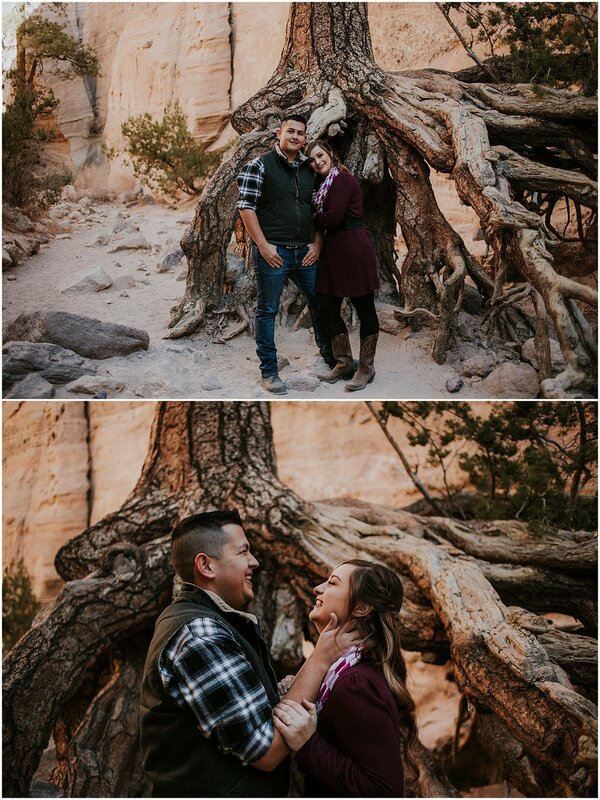 Joey picked plaid with a vest relatively fast because he felt it fit the theme with the Tent Rocks and Sam found a cute purple sweater dress that she loved and felt comfortable in. 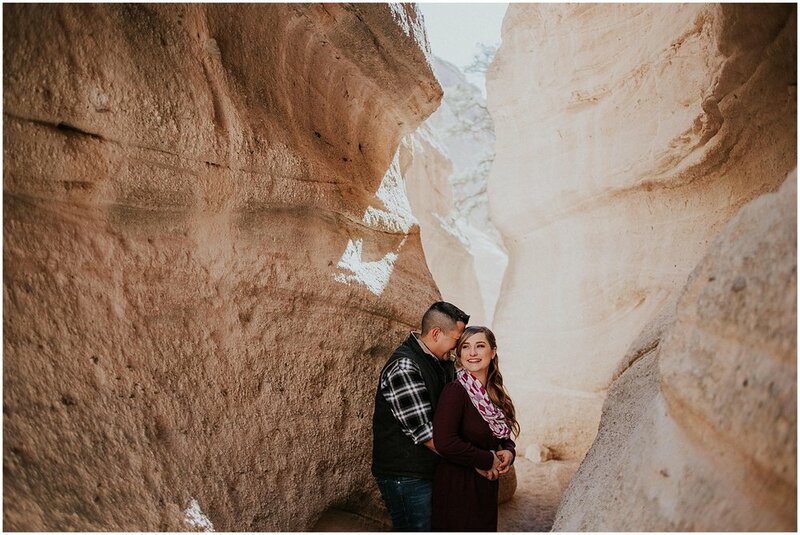 Scroll down to see more from their AMAZING engagement sesh as well as a mini interview with the lovebirds, testimonial, and slideshow from their love fest at Kasha-Katuwe Tent Rocks National Monument! You know you want to. Did you have your hair + makeup professionally done? "YES YES YES!!!! Juliette is amazing and I could not give her a higher recommendation for her she made me feeling amazing and so confident!" What does your perfect future together look like? 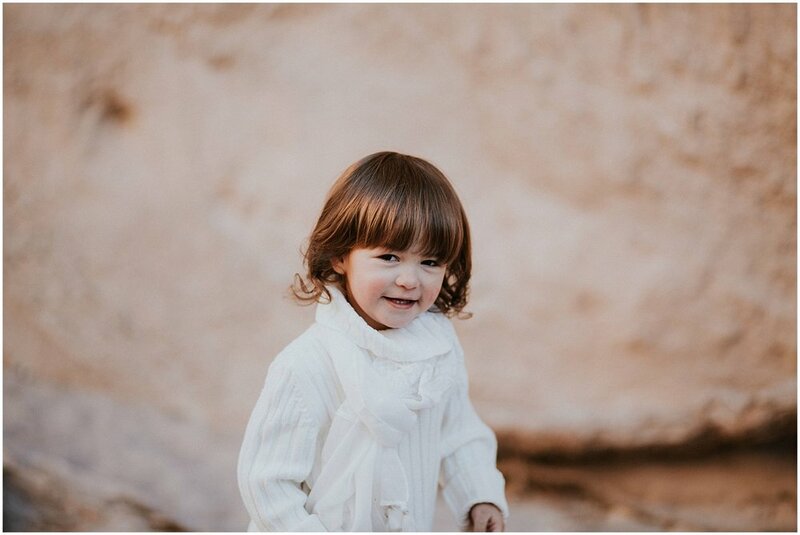 "Raising our daughter to grow into the best version of herself that she can be and do something that contributes to society. Always love each other no matter what. Being financially stable but in a manner that allows us both to pursue our individual dreams as well as combined dreams. Travel and expand our knowledge always." In 20 years, how do you want to remember yourself today? "As always putting our family first." What photography related advice would you offer to other couples? "Be picky! Photos are forever!"